Atsrid’s been busy after completing her sci fi & fantasy course…. One of our students who has recently completed the the Sci-Fi and Fantasy Certificate, has emailed us an update as to how shes getting on now she has completed her course. it sounds as though she is doing very well and we hope you enjoy viewing Astrids websites, blogs and exhibition work below. 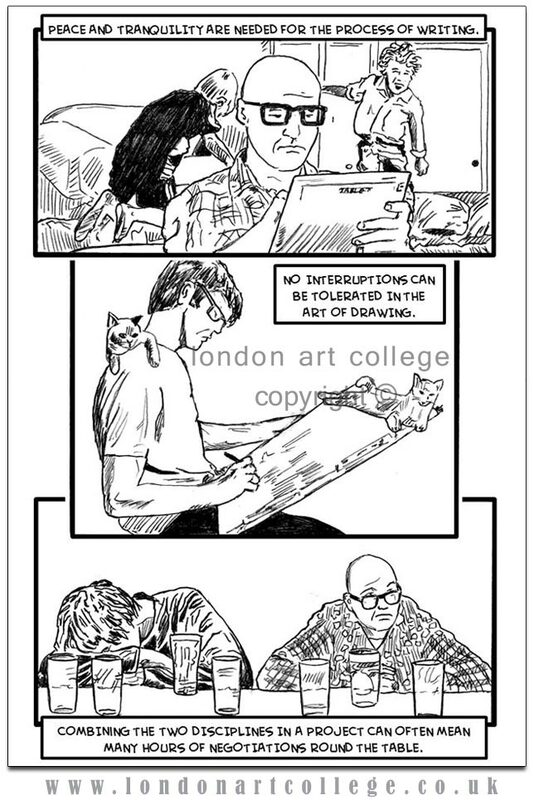 Since completing the London Art Colleges Science Fiction and Fantasy course I have been very busy with work. I am writing a new visual art themed blog as part of the blogger team on the recently launched “Amazing Stories” website – based on the cult science fiction magazine Amazing Stories Mag. I feel it is quite an honour to be asked to participate in this project and my recent qualification certainly helped! I plan to do lots of features of up and coming artists who are not yet well known, and am hoping that I will be able to feature one or other of my fellow Science Fiction and Fantasy Art graduates once in a while! You are more than welcome to visit my author page. My latest blog post is here, look at the discussion, and I thought that was a fairly uncontroversial, even slightly boring topic. Maggy asked Sara, a student currently studying on the Illustrating Children’s Books illustration diploma, if she would email me a copy of one of her wonderful pieces of artwork for the college news blog. Sara has very kindly written about herself and the artwork below. Sara Wyche – violinist and former veterinarian. Leicester born and bred, but now living in rural Argyll, after a circuitous career route through Germany, South London and Mid-Devon. I’ve written a few books on horses, for which I had to supply my own black and white line drawings. However, although they expressed movement, none of my drawings needed texture. I now realise I had completely overlooked the huge potential of pen and ink drawing. So, after years of drawing outlines of muscles and bones, (eighteen pairs of ribs are really not good for the eyesight), doing this exercise in the course book was like being let out of prison, and sent on vacation: a safari even – spiders included! Here is a wonderful piece of artwork from a student currently studying on the Children Illustration Course Diploma. Isn’t it wonderful! 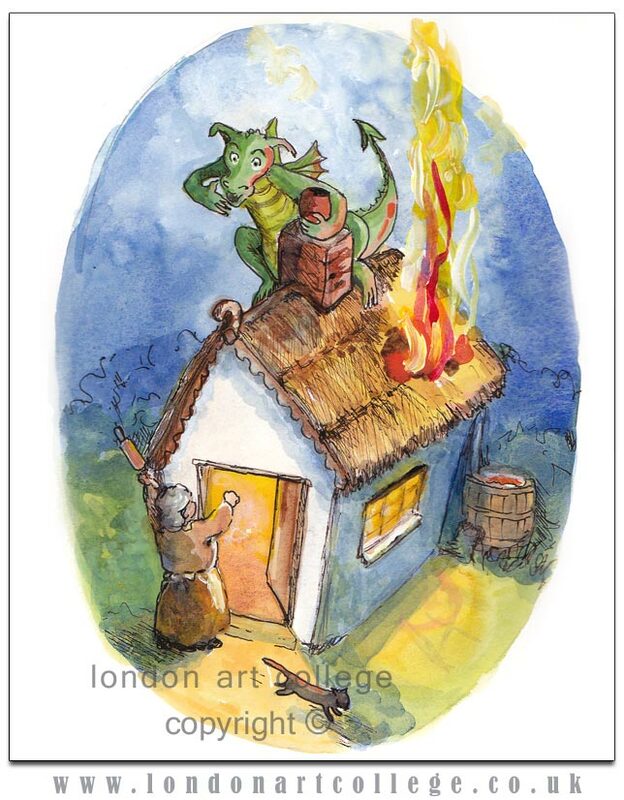 I think the dragon is laughing at the irate lady and her rolling pin. This illustration would be perfect in a children’s story. 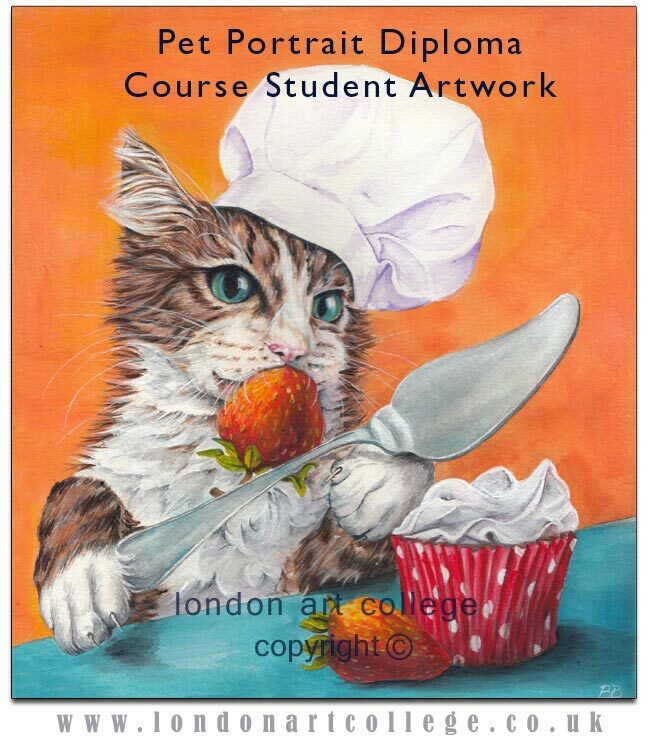 One of my Pet Portraits students has completed their course and passed with distinctions and you can find a detail of the painting below on the honours list page. 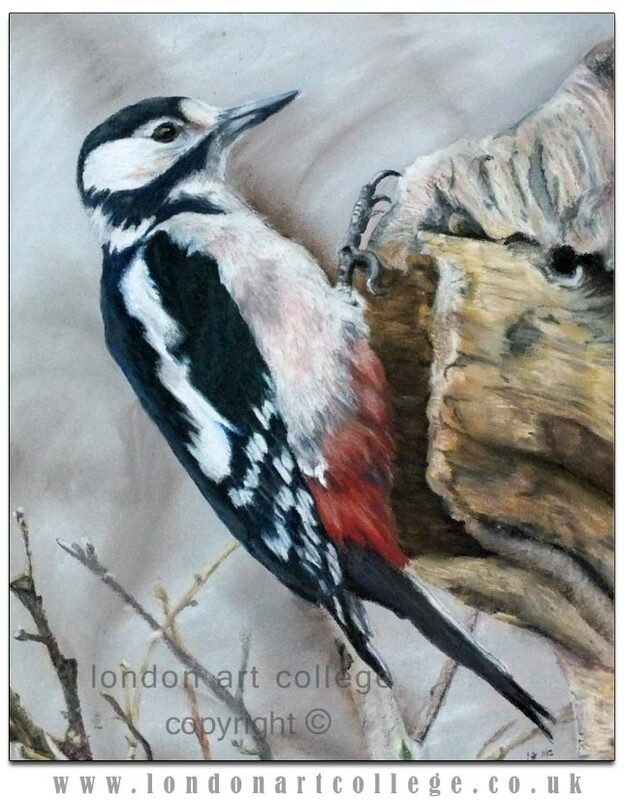 I asked Lisa if she would be able to write a little about the Woodpecker painting and how it came about, i hope you enjoy her story of the painting from concept to completion! One of the final assignment exercises was any animal with complete background. I chose the woodpecker because I love the way his colours are enhanced by the stormy rain-laden sky. The photograph was taken during stormy conditions on a Christmas break at our favourite holiday cottage in the Scottish highlands. The camera was set up on a tripod overlooking the bird feeder and taken through a patio door. I felt the effect of the dull grey sky slightly blurred by the horizontal rain would be perfect for my background. I added some hints of trees through the mist as I wanted to put the bird in a natural setting. Unfortunately the woodpecker was on a peanut feeder and he had curled his tail around for balance which meant I couldn’t use a straight tree trunk. I spent many an hour studying trees in our local area to find a branch that would suit. Eventually I found this one on the internet. I did a mock up on Photoshop and the woodpecker fitted perfectly. In the original photograph the feeder was on the upper branches of a birch tree the bottom of the photograph shows the tops of the lower branches. I used these branches to represent the top of a hedge and draw the eye upwards. I chose pastel to get the softness of the feathers and blurred background. I used Koh-I-Noor soft pastels for the background and a mixture of Faber Castell pit pencils and Derwent pastel pencils for the detailing. The paper used was art spectrum colourfix rose beige to enhance the slight pinkness of the bird’s chest. I rubbed the soft pastel in with my finger to create the blurred background and then added the foreground on top filling in detail with the pastel pencils. The black was created using burnt umber and ultramarine blue using the black pencil only in the darkest places. If you look at black birds they are never true black but have hints of iridescent blue, purple and greens. I really enjoyed this painting and the course overall. It reignited my interest in wildlife and has really given a boost to my confidence having been knocked back in the past. I would like to make a future career with my art something I never thought possible before. As I am a lover of wildlife and nature I think this is the area I would like to go down, hopefully selling through galleries and my own website. Ian Emerson has recently completed our graphic design diploma course with Vanessa Weaver and mentioned to Vanessa that he had been involved in a wonderful project with the ‘Living Memory Association’. Read and view Ian’s story below along with viewing his work. Inspiring!! My boyhood passion for comics has never really gone away and a lot of my interest in drawing stems from their influence. For me, a lot of the art work of the 1960s and 70s in comics such as The Wizard and TV21 is the best the genre has ever produced. Stories are not always politically correct to our 21st century eyes but there is a tremendous excitement and skill to the way these illustrators interpret the tales. Move on a few years, okay quite a few years and after a career in I.T. I am semi-retired. I’d never given up my art work though. Needing to fill some of my time, I began to volunteer for an Edinburgh based charity called the Living Memory Association. It’s a project that works predominantly with older people to record their memories and life stories – ‘giving people a voice’ is their motto. Fascinating work that has seen me interview, amongst others, an ex-artillery man who fought at El Alamein and Monte Casino and a woman who worked back stage at Edinburgh’s Empire theatre in the late 1940s. The project has produced many publications over the years, from straight forward life story books to histories of Edinburgh. They are always looking for new ways of interpreting stories. 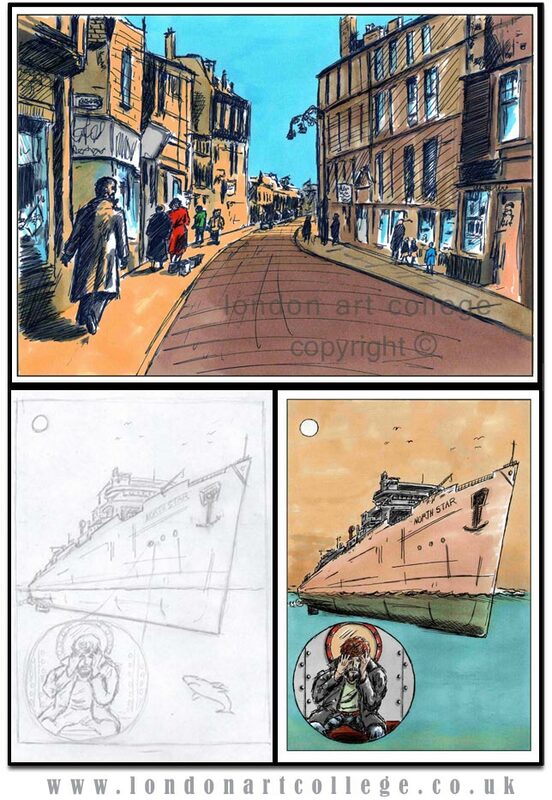 With this in mind Miles Tubb, one of the Living Memory Association workers suggested we might like to ‘have a bash’ at a graphic novel based on some the stories in the projects archive. 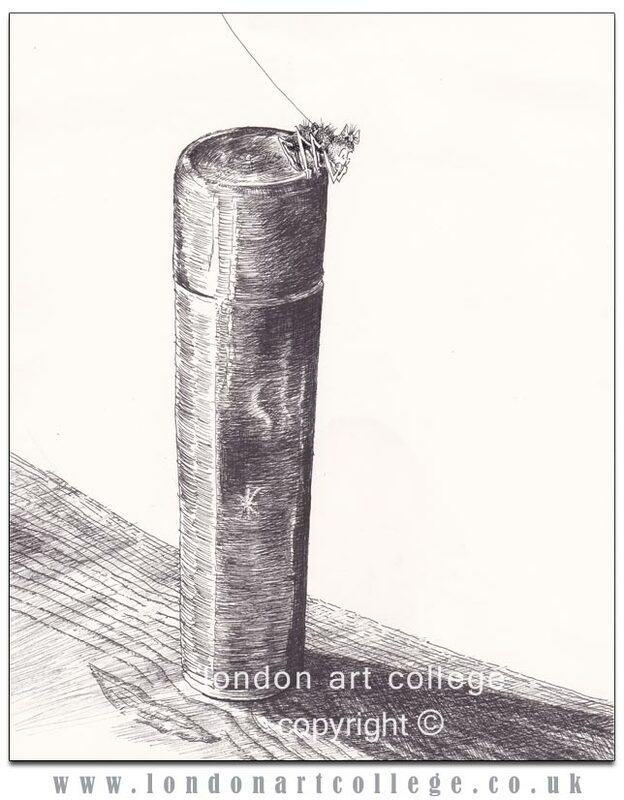 I had completed two of the London Art College courses (Science Fiction & Fantasy certificate and Graphic Design Art diploma) and felt considerably enthused by the experience so I readily agreed. Its been a very different and hugely enjoyable process. Miles would write the script; this consists of a description of what each page will be, plus its dialogue. It stretched my skills at times, which I think has definitely been a good thing. Interpreting someone else’s visual ideas has pushed me into new directions. The finished book, ‘Fallen’ is a largely fictional story but its sense of place and period is based on real interviews. The setting is Leith, the docks area to the north east of Edinburgh and the story is set over a two day period in 1928. Reception to ‘Fallen’ has been very exciting. We’ve had good press coverage and the book is in two of Edinburgh’s major bookshops. Sales are very encouraging. The confidence gained from ‘Fallen’ has been terrific. 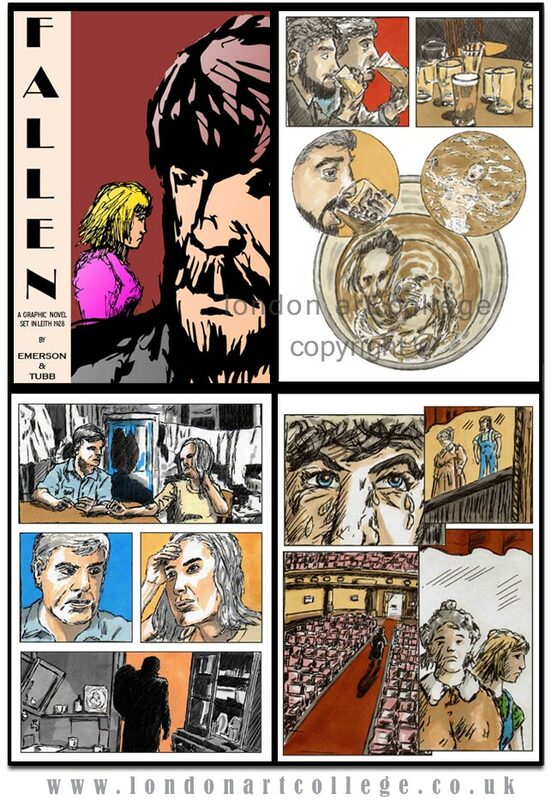 I am currently half way through the art work of a longer 66 page science fiction based graphic novel and later this year Miles and I will start on a second book for the Living Memory Association. This one will be based on wartime memories. Its been a worthwhile experience for all concerned. Its reinvigorated my art and has meant I really am drawing for a purpose. The LMA have gained publicity, income, another way of presenting people’s memories and older people a sense of pride. One of my pet portraits students sent a wonderful piece of artwork through to me this week to be critiqued. The brief was to create a surreal portrait and Barbara has created a fabulous portrait of her cat Chef Athos. Such a lovely story behind it too, I asked Barbara if she would like to write about it for the college news blog. I hope you enjoy reading about the painting below and viewing Chef Athos! I occasionally foster stray kittens, raise them and find them a home. Last year they brought me 3. They were barely 2 weeks old and had to be bottle fed every two hours. The rescuers said they were the ugliest kittens they had ever seen! I think they were just sick. One died soon afterwards. For the first two months of his life, Athos was very sick and close to dying. Given he was sick and his brother Noisette had a condition which needed periodic checking, they were formerly adopted by us and became part of the household (2 humans, 6 cats, one dog and a parrot). With time Athos just blossomed into one of the cutest and craziest kittens I had seen in a while. One of his funniest quirks is eating veggies and fruits. At first, we just noticed plums, cherry tomatoes, strawberries, diced courgettes and more would mysteriously disappear from the kitchen counter, but one day we caught the thief: Athos the kitty! He especially loves pumpkin and melon and patiently waits for me to give him small slices which he proceeds to eat under the table, growling at any creature that dares approach him. Athos was perfect for a surreal animal painting. I thought about his behaviour and looked at lots of paintings, photographs and settled for a “chef version” of him. I wanted a slightly “pop” style and I chose strong colours and, for patterns, a cupcake with white dots to kind of match the natural design of strawberries. I made a few thumbnails and thought I needed some lines in my drawing, which I got with the edge of the table, the knife and the direction of Athos’ body. Although I love coloured pencils I wanted vibrant colours and so settled for acrylics, which are very versatile, giving you freedom to paint over mistakes or changing details.